Published on 25 January 2015; revised. Here is information on subsistence living that I found intriguing. For myself, I’ve printed what looked important out. Link: “Subsistence Economy,” in Wikipedia, https://en.wikipedia.org/wiki/Subsistence_economy ..
Link:”Grit: Rural American Know-How,” http://www.grit.com/ ..
Link:”Mother Earth News,” https://www.motherearthnews.com ..
Link:”The Old Farmer’s Almanac,” http://www.almanac.com/ ..
Link:”Archimedes Screw,” in Wikipedia, https://en.wikipedia.org/wiki/Archimedes%27_screw ..
Link:”Egypt’s Nile Valley Basin Irrigation,” by Sandra Postel, http://www.waterhistory.org/histories/nile/t1.html ..
Link:”Noria,” a water lift, in Wikipedia, https://en.wikipedia.org/wiki/Noria ..
Video: “Wooden Water Wheel in Europe,” [Noria], by epSOS.de, 24 April 2015, https://www.youtube.com/watch?v=3VxMgfRcgp8 … Notice the shape of the buckets, which may be important to the function. Link:”Sakia Water Pump,” in Wikipedia, https://en.wikipedia.org/wiki/Sakia ..
Link:”Shadoof,” a counterpoise lift, in Wikipedia, https://en.wikipedia.org/wiki/Shadoof .. 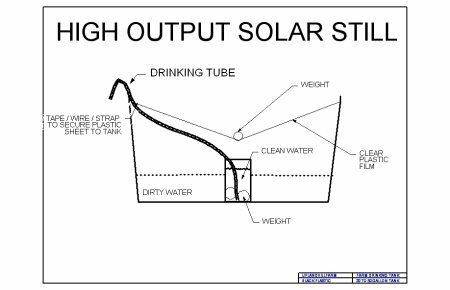 Image: Homemade, High-Output Solar Water Still: https://i.pinimg.com/736x/cf/a4/46/cfa4461e2f7578c34b3e9dae5ba24e9c–water-still-camping-survival.jpg ..
Link: “How to Build a Solar-Powered Still to Purify Drinking Water,” by Rich M , http://www.offthegridnews.com/grid-threats/how-to-build-a-solar-powered-still-to-purify-drinking-water/ ..
Link: “Solar Still,” http://www.bionity.com/en/encyclopedia/Solar_still.html ..
Link: “Solar Still,” in Wikipedia, https://en.wikipedia.org/wiki/Solar_still ..
Link: “Hut,” in Wikipedia, https://en.wikipedia.org/wiki/Hut … See also the links at the bottom of the page. Link: “These Quonset Inexpensive Kit Homes Start at Less than $8,000: http://buildinghomesandliving.com/metal-buildings/these-quonset-inexpensive-kit-homes-start-at-less-than-8000 ..
Link: “Simple Pit Latrines,” WHO, http://www.who.int/water_sanitation_health/hygiene/emergencies/fs3_4.pdf ..
Link: “Appropriate Technologies on Low-Cost Toilet Technology,” Gramalaya – Tiruchirapalli, http://www.gramalaya.in/pdf/appropriateLowcost_toilet_technology.pdf ..
Link: “Guide to Do-It-Yourself Projects,” by Mother Earth News, http://www.motherearthnews.com/diy/directory-of-diy-plans-zl0z1404zswa ..
Link: “Projects and Plans,” by Popular Mechanics, http://www.popularmechanics.com/home/how-to-plans/ ..
Link: “Primitive Technology,” a youtube series, https://www.youtube.com/channel/UCAL3JXZSzSm8AlZyD3nQdBA ..
Link: “Primitive Skills,” a youtube series, https://www.youtube.com/channel/UCs8DNFOxYen3kuj87aWKG9g .. This entry was posted in A - My Favorites, Alternative housing, Sustainable living - survival and tagged alternative housing, Archimedes screw, drinking water, huts, low tech water, Nile irrigation, noria, primitive sanitation, primitive water, sakia, shadoof, simple well, solar still, solar stills, survival skills, sustainable living, water for the world, water lifts on 25 January 2015 by Alice B. Clagett.